All-Asian Satellite Television and Radio Operator (or better known as Astro) is a Malaysian direct broadcast satellite (DBS) Pay TV service. It transmits digital satellite television and radio to households in Malaysia and Brunei and has operations at the All Asia Broadcast Centre located in Bukit Jalil, Kuala Lumpur and MEASAT in Cyberjaya. Astro was granted an exclusive license as a sole Pay TV provider by the Malaysia federal government until 2017. It competes with HyppTV, a IPTV service by Telekom Malaysia (TM). As of September 2014, Astro has provided services to over four million subscribers. Astro is a wholly owned subsidiary of Astro All Asia Networks plc. and operated by MEASAT Broadcast Network Systems Sdn. Bhd. On 29 September 1996, Astro was officially formerly known as "Philips ASTRO". It was officially launched by the digital video broadcasting – satellite form of the family variety light entertainment programme translated into Malay (Malaysian) on Astro Ria, Cantonese on Astro Wah Lai Toi and Tamil on Astro Vaanavil. ASTRO launched Malaysia's first high-definition television service branded Astro B.yond on 11 December 2009. The roll out of these services is estimated to cost some RM200 million, including marketing and operating costs of approximately RM150 million, over the next financial year, ahead of revenue and earnings from these services. Astro B.yond also introduced a Digital Video Recording (DVR) service, available through the Astro B.yond Personal Video Recorder (PVR) and an external hard disk drive connected to the Astro B.yond decoder. The Astro B.yond PVR comes with an inbuilt 500GB hard disk and allows customers to record up to two live programmes at one time, rewind and pause live TV. Recording services is also available through Astro B.yond via a compatible external hard disk drive and activation of the recording service by Astro. In April 2011, Astro B.yond introduced its IPTV services through Astro B.yond IPTV a collaboration with TIME dotCom Berhad (TIME) to deliver IPTV. Since December 2010, this provides a wide choice of Astro channels in HD (High-Definition) with personal video recording and video-on-demand services delivered via TIME's 100% fibre broadband. Astro B.yond IPTV will be progressively available in Klang Valley and Penang. At present, Astro B.yond IPTV is available at 60 high-rise condominiums within Mont Kiara, KLCC, Bangsar and Penang. The first generation Astro B.yond box is a rebranded Pace plc DS-830NA. The latest and current B.yond set-top-boxes are now manufactured by Samsung. Astro IPTV is an Internet Protocol Television service by Astro. Launched on 20 April 2011 as Astro B.yond IPTV, its subscribers were entitled to high definition Astro channels, personal video recording, video-on-demand, high-speed internet, and voice services. 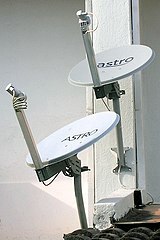 Astro’s initial target audiences were residences of high-rise buildings that having difficulty accessing HD and PVR services due to several technical limitations of the centralised dishes installed at building's rooftop. By including HD and PVR services with its IPTV, Astro was able to offer HD services to selected high-rise residences and buildings. This was made possible by partnering with Time dotCom Bhd and later on Maxis Berhad (April 2013). Astro B.yond IPTV was rebranded to Astro IPTV in February 2014. Astro NJOI is a Malaysian first free-to-view satellite TV service by Astro. Launched by Government of Malaysia and Astro on 18 February 2012, with 18 TV channels and 19 radio stations. Currently, NJOI offers 26 SDTV channels, 5 HD channels and 26 radio channels. ^ Also available on Astro GO. ^^ Astro GO or NJOI Now exclusives. All stations available to all Astro and NJOI customers. The direct-to-home (DTH), is broadcast as high-power Ku-band transmissions using the transponders of the MEASAT satellite system. Reception of the service signals uses a fixed 65-cm diameter dish antenna. Astro service is currently transmitting from 3 satellites, which are Measat 3, Measat 3a and Measat 3b. Ku-band signals can be affected by rain attenuation (rain fade), making it susceptible to frequent outages in heavy rainfall areas such as Malaysia, the operators of Astro have employed a tailor-made system to boost power of the satellite delivery system to overcome this problem. The service availability of 99.7%, however, is still a topic of much debate by subscribers. Initially, the HDMI output on every B.yond boxes is disabled (including Njoi) if the subscriber did not subscribe to HD service. However, later 2014 onwards, HDMI output is now enabled to every customers using B.yond boxes via newly designed firmware with multilingual user-interface. Since its launch, Astro transmits programming with encryption to mitigate signal piracy. The receiver (also known as an IRD, or "integrated receiver-decoder") uses ISO/IEC 7816 smart cards which tell the receiver how to decrypt the programming for viewing. The first generation of smart cards were used until 2004. The encryption uses the SECA Mediaguard. The second generation of smart cards were introduced in 2004 and used until 2008. The encryption uses the improved version of Mediaguard. The third generation of smart cards were introduced in 2008. This is the current "standard issue" smart card. It uses the NDS VideoGuard encryption system. Currently, Astro uses the enhanced VideoGuard encryption system for B.yond boxes as it features smart card pairing technology, where the smart card are only allowed for the particular set-top-box issued by Astro, and it is no longer interchangeable like the legacy Astro set-top-boxes. As of February 2015, Astro has provided services to more than 4 million subscribers, which represents more than 50% of Malaysia's television households. As of Q4 2016, Astro has 3.4 million pay TV subscribers and 1.6 million NJOI subscribers, making a total of 5 million customers, which represents 71% household penetration. ^ "Have Trouble With Our Services | Help & Support | Astro". support.astro.com.my. Retrieved 19 February 2017. ^ Astro.com.my. "NJOI – Free Satellite TV from Astro". www.astro.com.my. Retrieved 19 February 2017. ^ "Jeff Lee - Why my astro set top box HDMI port output not... | Facebook". www.facebook.com. Retrieved 19 February 2017. ^ "Astro aims to increase household penetration to 75% next year - Business News | The Star Online". www.thestar.com.my. Retrieved 19 February 2017.